Providing youth the tools needed to get working in the forest industry is the aim of the BladeRunners Program in Nakusp that is finding hands-on success for partners and participants. Community organizations and industry have come together to provide young people an opportunity to get started in a new direction. The BladeRunners Program is now off and running in Nakusp with 10 eager participants. 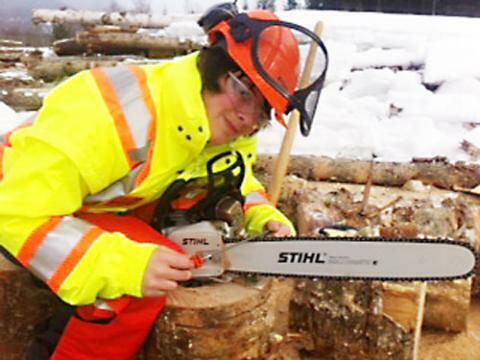 The program—which is run through Selkirk College—provides technical and field training in entry-level forestry work to youth participants facing challenges getting training or employment. A group of 10 youth are currently hard at work on a fire wood project near Nakusp. BladeRunners was created in 1994 during the construction of General Motors Place in Vancouver. Its purpose was to match construction industry needs with opportunities for disadvantaged inner-city youth. Because many of the at-risk youth (15 to 30 years old) were experiencing problems outside of their work hours, a system of 24/7 support from BladeRunners coordinators was developed. This led to the award winning BladeRunners model which is funded through the Canada-British Columbia Labour Market Agreement. Selkirk College operates the BladeRunners program at its Trail Campus and Nakusp Centre. The Nakusp BladeRunners program focusses on the forest industry. Students take technical training courses that offer certification in first aid, chainsaw safety and operation, traffic control and flagging, construction safety training systems, WHMIS, Oil Sands Safety Association orientation, and Occupational Health & Safety. The work experience program is being headed up by Guy Duchaine who has been hired to facilitate and Alexandra Krajewski who will support the program in her role as the job coach. Duchaine has signed on to lead and mentor the team that will learn skills and gain work experience while they cut up logging truckloads of birch into firewood. The wood will be picked up a former Nakusp resident and sold in Calgary. The proceeds will be used to pay the wages for the workers. The program—which runs February and March—also benefits from significant partnerships with local organizations that include Arrow & Slocan Lakes Community Services, Nakusp and Area Development Board, and the Nakusp and Area Community Forest. The BladeRunners program and social enterprise work experience component aligns with the recommended actions from the recent Nakusp Business Retention and Expansion Survey and the Kootenay Regional Workforce Table Plan. The expansion survey identified that there were jobs in the forest industry, but training was needed. The workforce table plan found more was needed to enhance training related to small and medium sized businesses. Find out more about the BladeRunners program by calling the Nakusp Campus at 250.265.4077 or via email at nakuspce@selkirk.ca. Learn more about the BladeRunners Program and join us on Facebook.